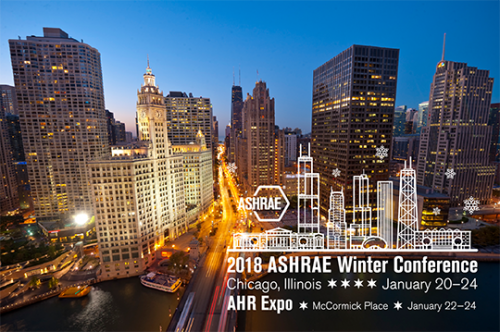 ATLANTA – ASHRAE is pleased to announce registration is now open for its 2018 Winter Conference, to be held in Chicago, Ill., Jan. 20-24, at the Palmer House Hilton. Registration is also open for the AHR Expo, Jan. 22-24 at McCormick Place, co-sponsored by ASHRAE and the Air-Conditioning, Heating, and Refrigeration Institute (AHRI). The Building Automation and Control Showcase: This area is designated for building automation, energy and facility management systems; climate controls; monitoring systems; wireless and cloud-based options; and other networked building systems including lighting, security, fire alarms, and more. The Software Center: This area is designated for HVACR related software, both off-the-shelf and customized solutions, for the following: project and field service management including estimating, inventory control, GPS tracking; system design, specification and analysis; remote-based and cloud-based software; and more. The Indoor Air Quality Association Pavilion: This area is designated for member companies of the Indoor Air Quality Association. These exhibitors will be showing products related to indoor air quality, such as air quality monitors, exhaust fans, environmental testing systems, dehumidifiers and more.